That's pretty cool -- and something I've heard before, that poor reception (or no reception in this case) drains the battery pretty fast. Once you are on wifi, are you able to receive calls using google voice somehow through gchat perhaps ? @ErikJHeels - yep, it's an elegant device, no question. But I wouldn't trade the level of control I have over my phone for anything. @RickKlau -- nice -- that looks like a smart solution. Great writeup on Tasker. 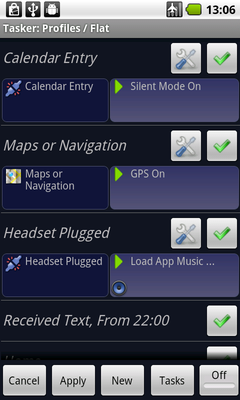 It is a fantastic application that provides you with the ability to really turn your Android device into a SMARTphone. There is excellent developer support and a very active developer/beta tester community on Google Groups. While it is a paid application, I have found that you can replace numerous other apps with profiles that you develop using Tasker. It has certainly been worth the minimal price for me. There is a bit of a learning curve with the application. For your readers who are interested in getting started with Tasker profiles, I have a bunch of profile tutorials at http://profileify.com. They will provide you with a flavor of what you can do with the application. You can also access the site from within the Tasker application using the Browse Profiles button (in the menu) and selecting my site. I invite any of your readers to submit profiles or tasks that they develop so that we can get them out to other Tasker users! Just use the submit button on the site. Chris, thanks for the tip - Profileify looks awesome.